This week Andy and Derek look at three new titles, each one visiting the fantastic in one form or another. Before they jump into the reviews, however, they discuss some of the big comics news from the past week: the announcement of the 2017 Eisner Award nominations and Free Comic Book Day. The guys don’t go into too much detail about the Eisner nominees because they plan on devoting an upcoming episode to that topic. However, they do briefly mention the curious situation surrounding the nomination of the Love Is Love collection in the Best Anthology category. They have much more to say about last Saturday’s Free Comic Book Day. Both guys share some of their experiences at their local shops and the free comics they got there. Listen to the podcast’s FCBD episode for more details. But then the Two Guys get into the heart of this week’s show. They begin with Chris W. Kim’s Herman by Trade, coming out this week from SelfMadeHero. Although on the surface this appears to be a more realistic narrative, its fantastic elements become apparent in the transformation of the title character who has the ability to change his appearance and mimic others’ abilities at will. As both Derek and Andy point out, this is an unusual story that sticks with you long after reading. Next, they turn to a new graphic biography that is all about fantasy, Rise of the Dungeon Master: Gary Gygax and the Creation of D&D (Nation Books). The art is by Koren Shadmi, but the book is written by David Kushner, based on a profile he wrote for Wired magazine in 2008. What’s most notable about this brief biography is the narrative point of view, almost entirely presented in the second person. This is fully in keeping with the spirit of role-playing games, where in this case the the narrating presence is, in essence, your “dungeon master” guiding your awareness as you enter the creators’ biographical realm. Finally, Andy and Derek conclude with the latest collaboration from Jonathan Luna and Sarah Vaughn. Eternal Empire #1 (Image Comics) is a fantasy set in a distant world that, as Andy points out, is reminiscent of Game of Thrones. In fact, the guys spend a good bit of time speculating on the originality of this series, wondering if the unique elements will become more apparent in the issues to come. And while Andy isn’t sure if he’ll stick around to find out, Derek is going to give Eternal Empire a chance, especially given his appreciation of the Luna brothers’ previous comics, and especially Luna and Vaughn’s previous series Alex + Ada. Eric. Jim and Reggie get together to talk about their favorite arcade games of all time. What made their lists? what are their least favorite games? Did Reggie see a kid get mugged while playing a game? Why was Jim not a fan of arcades? Did Eric’s greatest achievement happen at the arcade? Find out the answers to these questions and so much more in the Just for the Hell of It Top 5 Arcade Games episode. Enjoy! 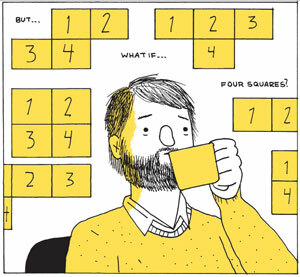 In his new nonfiction graphic novel Tetris: The Games People Play, Box Brown explores not only the amazing story of the creation of the popular game and the fight over the rights to it, but the larger point of how and why humans began to play games. Brant Fowler gives a special update on the future of Zone 4 going forward with a new format, new cast members, new programming, and more! Welcome back to the 12 Days of Zone 4! In today’s installment, I talk about my first gaming experience with Injustice: Gods Among Us for the Wii U! Come back tomorrow for another installment of the 12 Days of Zone 4 as I give my thoughts so far on the Spider-Verse event! This week, the cast is light due to holiday festivities and illness, so Brant and Chris chat for a while. First, they talk about Thanksgiving, and some random chit-chat. Then, it’s on to the news, talking the Jurassic World and Star Wars VII trailers, sequel news, Convergence week 3, and more. For Topic Time, they discuss a list of the Top 15 Lamest Superheroes in Comics (aka Biggest Turkeys), which they have some issues with. To close out the show, they go to announcements before sidetracking into some wrestling discussion as the show comes to an end.